- Available for up to 1600mm wide belts. Spot repair press. Aluminium made. 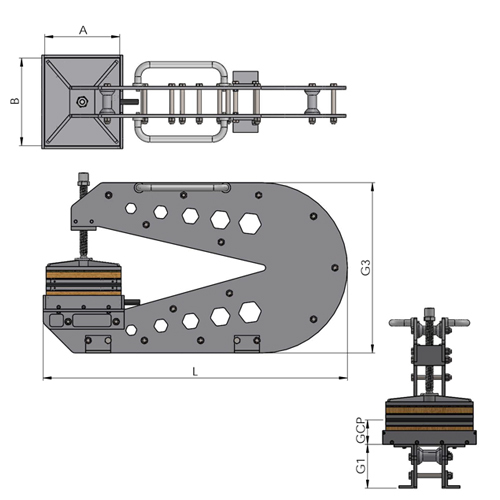 Available for several belt widths up to 1400mm (superior dimensions under request). The vulcanizer includes pneumatic pressure system, heating system and cooling system. The vulcanizing area is composed by 2 heating platens that hold the heating elements, the temperature probes and the cooling pipes. Quickly removable to make handling easier. Completely automatic process programmed from the control unit (heating, dwell time and cooling). The pressure is applied to the belt by means of a pressure bag (air/water), of the same dimensions of the heating platens. Maximum pressure 5 bar (75PSI). Fast heating of the platens (300x300mm) by means of heating elements. Each one is made with an asymmetrical winding to supply an even heat distribution all along the belt. The elements get warmer on the ends to compensate the loss of temperature and avoid heat concentration in the middle. Temperature programable up to 200º C / 392º F.